The Australian Travel Exchange is the largest annual networking event for travel and tourism in the country, connecting the travel industry all over the globe with the aim of helping and supporting tourism in all regions of the country. This year’s ATE17 was held in Sydney at the ICC, giving the perfect opportunity to promote what New South Wales has to offer. This year’s event in May was a big success with a turn up of over 2,500 delegates and 548 international travel companies from 30 different countries, which resulted in over 45,000 appointments being made, all in a help to benefit the many tourism regions of Australia. 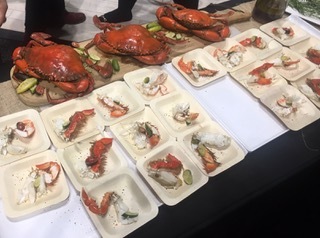 The Tweed region was in the spotlight this year, when over 300 fresh servings of Tweed River crabs, marinated in Husk Distillery’s Tumbulgums Ink Gin and Buck’s Farm’s Chillingham Finger Limes, provided the perfect treat and a fantastic show of what Tweed Heads has to offer in terms of local cuisine. Destination Tweed – an organisation promoting the Tweed region and which our Cabarita Beach resort is a member of – provided a pleasant afternoon tea at the event, and did well to promote NSW and what Tweed Heads has to offer. Tweed Heads is known for its glistening picturesque beaches, the Tweed River, lush rainforest areas, and of course it’s fine cuisine, making it one of the more upcoming popular tourist destinations in NSW, and soon a worthy rival to the neighbouring Gold Coast, which it shares the popular Coolangatta Beach with. The Beach Cabarita is a luxury beachfront resort based in Tweed Heads, and a perfect opportunity to discover what the region has to offer, providing attractive Tweed Coast accommodation with the choice of apartment and penthouses, paired with a wide range of resort facilities for a complete and satisfying holiday. Our resort is ideal for families and couples, and our location in Tweed Heads offers a refreshing holiday experience. Experience the Tweed Coast with The Beach Cabarita at www.hisitedirect.com.au.